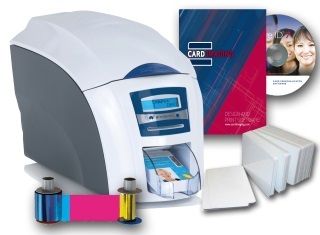 Card Imaging offers a variety of ID card systems to meet every budget and feature requirement. Our systems print directly onto durable plastic cards which cost just pennies. There's no cutting or lamination required and the process takes just 30 seconds. All systems include powerful, easy to use design software for customizing your card with logos, backgrounds and data fields that give your card a one of a kind look. Issuing a card is easy. Enter your data, snap the photo and hit the print button. You can even use your own digital camera to capture the photos. Our most popular systems include a PC which is preloaded with sample cards, card design software, camera and printer controls. Just plug in the PC and your ready to start making ID cards. The Basic ID system is the most cost effective way to create custom, full color ID cards. Insert a blank card and print directly onto tough, durable PVC plastic. There's no cutting or laminating required. Flip the card over if you want to print on the back. Cards are printed in less than 30 seconds. We provide everything else to start making custom designed cards right out of the box. This is our most popular system. 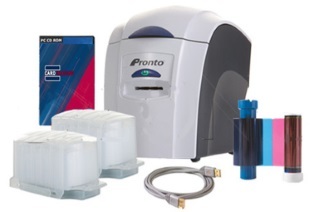 The printer includes a large 100 capacity input hopper and 300 capacity color ribbon. The 3 year warranty provides worry-free operation and top rated technical support. Cards print to the edge in beautiful full-color at a speed of 133 cards/hour. Upgrade your printer to dual-sided at any time by inserting an upgrade chip. Email us for your instant rebate!